WooHoo!! I did it! 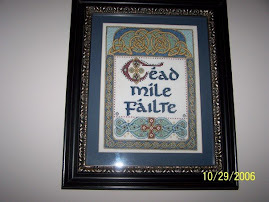 This is a small cross-stitch that hangs in our family room...it says "Nova Scotia"...and was by Victoria Sampler...I believe. Okay, today is the big day that I plan on getting to know this blogging thing! I hope to add some photos today as well. Tomorrow is hubby's Birthday.....mine is on Saturday and our son's is next week!! Busy Birthday week here. Yesterday I went to Blanket Club with my cousin...okay, there was just the two of us, but it's a great chance to enjoy tea, sweets, lunch and ofcourse work on our swedish weaving blankets! Last night I worked on my "Isabella's Garden" cross-stitch while watching American Idol. Well, I finally did it!! I became a blogger!! I'm very new at this, so we'll see how it goes.